The Art History course aims to introduce the student to an appreciation of important works of Art in their original settings. 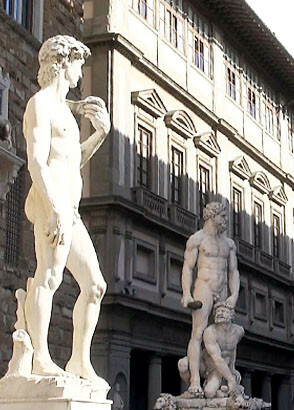 From Romanesque to Mannerism in Architecture, Painting and Sculpture in Florence. The students will be given an overview of the main art historical periods from Romanesque Architecture and the peculiar Florentine interpretation of the Gothic style to the wonderful XIVth Century paintings of Cimabue and Giotto. Special attention will be paid to Florentine Renaissance and Italian Mannerism. The programme foresees classes on site (museums, churches, building). This course is offered in the afternoon throughout the year, combined with a Standard Course in the morning. The course is held in Italian an elementary knowledge of Italian is required in order to attend it. Language courses are suspended from 23rd Dec 2019 to 6th Jan 2019. Please note this course is available with minimum three participants applying for same dates.